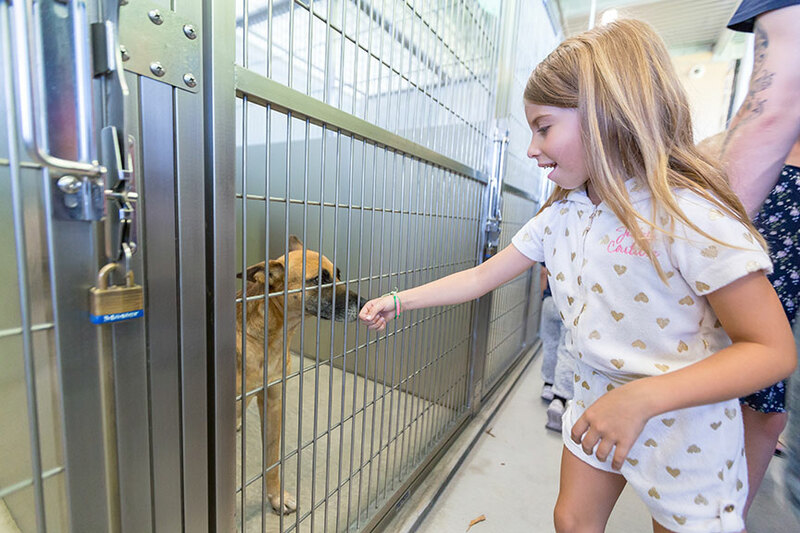 Herds of animal lovers came out for the grand opening of the El Cajon Animal Shelter on June 2, 2018. Beginning with speeches and a ribbon cutting ceremony, the event celebrated the completion of a project more than 10 years in the making. “We’ve had a team of 20 architects, designers, artisans, engineers, and over 600 construction managers and builders, but it is a fraction of the effort compared to that of the larger community standing in front of me who believed that this building matters, and that the lives of these animals matter,” said Amanda Schultz, FPBA’s Principal Architect on the project. After the ribbon cutting, the crowd formed a line to take a look inside and meet the pets-to-be. The City of El Cajon offered a special $5 adoption rate in honor of the original price charged by the former facility in the 1950s. Outside, visitors enjoyed hot dogs, shaved ice, face painting and a photo booth. The new 14,000-square-foot shelter is more than double the size of its predecessor and features new amenities such as a medical center and grooming area. FPBA has been involved in the project for seven years, assisting the City of El Cajon with a space needs assessment prior to designing the facility at the final selected site. It was a pleasure to see the animal shelter open its doors to the public and begin serving East County residents, whether they be human, canine, feline, reptilian, etc.